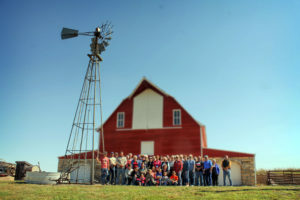 The 2018 Barn Fest featured participatory demonstrations of log cutting and timber framing; presentations on the challenges of preparing and moving a barn, materials and designs used in the construction of barn quilts and painting techniques based on the National Standard of Rehabilitation of Historic Properties, a performance by “The Spirit Dancer” from Topeka, a showing of the movie “Home on the Range”. The Barn Tour was on the second day and focused on adaptive re-use of barns. 30 participants toured 6 barns. A small grant from the Foundation supported the event.